We’re very excited to be working with some great veggie bloggers from around the globe! Read the details in today’s press release. Look for meals rated by these excellent writers next time you’re trying to find a great veg meal, and click on the links back to their blogs to read more in-depth reviews. 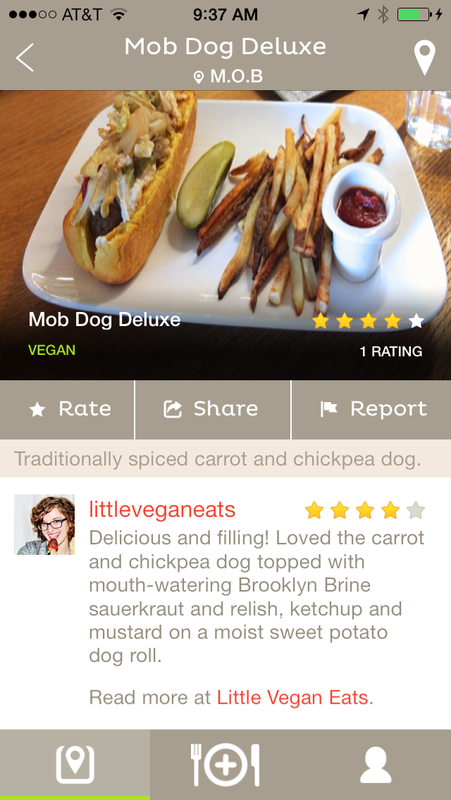 Here’s an example from one of our partners, Little Vegan Eats. PlantEaters launches a partnership program with vegetarian bloggers to add high-quality meal ratings to the service, making it even easier to find great vegetarian or vegan meals when dining out. New York, NY (PRWEB) February 18, 2014 – PlantEaters, an iPhone app that helps you find vegetarian meals at restaurants around you, announced today that is has partnered with vegetarian bloggers from around the country to provide high-quality, expert ratings of vegetarian and vegan meals that they write about on their blogs. When a blogger writes a review of meals at a vegetarian restaurant, or even just vegetarian or vegan meals they had at a non-vegetarian restaurant, they’ll also rate those meals on PlantEaters. The ratings will include a link to the original blog entry so that members of PlantEaters can click through to read a more in-depth review of the restaurant and meal. With over 10,000 vegetarian and vegan meals, PlantEaters is quickly becoming the most comprehensive source of dining information for the veg crowd. Unlike other services, PlantEaters is focused on meals rather than restaurants. This opens up more dining options by uncovering all of the great vegetarian dining options increasingly being offered by non-veg restaurants. As PlantEaters continues to grow, more meals are being added and reviewed by members of the community itself. The PlantEaters staff also continues to add meals from all over the globe. The partnership with veggie bloggers is a continuation of their commitment to helping vegetarians and vegans find great meals when dining out.